My 2014 Highlander Limited's power hatch seems to have malfunctioned and I was wondering if anyone else had a similar experience and what solutions were found. Here's what happened: I activated the hatch from the door itself and it only went up 2 feet before stopping. Pressed the switch again and it went down 2" and stopped. Pressed again and it went up 2" and stopped. Tried it with the fob and dash switches with the same results. Turned off the engine, restarted, same results. Checked to see if the rear wiper/washer worked (it did), and after that, pressed the hatch switch on the dash and the hatch went down and stayed closed. I also had an instance where the hatch went up on its own while in the garage - hit the garage door and stopped. At the same time this was going on, the back up camera is very fuzzy and I almost hit a garage door backing up (no warning sounds). Here in Minnesota, it's been a typical winter with lots of road salt, which has coated the vehicle including the rear hatch area. My suspicion is the salt/chemicals used somehow affected the hatch, but I don't know for certain. Will be taking it in to my Toyota dealer. Anyone have ideas? Thanks. (Yes, I will wash it but wanted to have the dealer look at it first). Hmmm...maybe a bad ground somewhere in that circuit. Well if it's a gremlin, it'll be back! Hope it's solved, though. Thanks for the update. Interesting to know! A common strategy for power gates and windows is to shut them down if the motor for one of them starts drawing too much current. As long as the gate or window is moving. the motor draws a known current level, but when the gate reaches the end of its travel the current rises since the motor gets stalled out and the system shuts down. In a lot of cases, the controller for the motor learns that position as the full open or closed. So then you have something go wrong and the gate or window sticks mid travel. Its likely that the controller relearned the door position as full open so then it stopped having full travel. What the tech had to do was make the system relearn the stops. At least they made the re-learn easy. Thanks for all the ideas. But it happened again - when the hatch was opened, I pressed the button on the hatch to close, and it only went down about 3 inches from the full open position. I then manually closed the hatch, heard the latches, and started to drive. The ! indicator was showing on the dash, and the graphic showed the rear hatch glass open. I pulled over, opened and closed the rear hatch glass (which was not open to begin with), and the ! indicator cleared. I am, once again, calling the Toyota dealer with this latest episode. The only common factor in both instances was that the vehicle was on an inclined driveway. And I'll ask them to check the ground, Mr. Shiftright. Update on hatch issue: Toyota dealer tried to replicate issue without success and also ran tests on the electrical system, also without finding anything out of a normal range. Has anyone else experienced this issue with the 2014 Highlander power hatch? Thanks. Our local Toyota dealer suggested I should video the problem to prove to Toyota there is one. Well, today (12 30 14) with the outside air temperature at 1 degree F., I did record the malfunction and burned a dvd for the dealership (too large a file to e-mail). After they watched it, the local dealer said Toyota will now cover the replacement of the motor and struts for the hatch. I am hopeful that will correct the problem. Apparently, the hatch mechanism doesn't like cold weather. If you look at the Highlander forums on ToyotaNation.com you will find that others have had similar problems with the power liftgate. Some have had success turning off the power operation via a button inside the glovebox on the left side then closing the hatch and activiating the power operation again. I'm surprised that someone would force open or close the hatch without hitting this button first. Thanks, Cromagnum_man. However I believe my issue is related to how the hatch mechanism functions (or doesn't function properly) under cold outside air temperatures. I have the hatch problem consistently yesterday and today (1/4/15 and 1/5/15) when the outside temperature here in Minnesota is -1 F or below. Have other 2014 Highlander owners had similar cold weather automatic hatch problems? Update: Toyota and my local dealer replaced the hatch struts (which contain the motor) today. So far, so good; the real test will be when we have cold (below zero F) temperatures here in Minnesota. I appreciate the dealer's efforts and Toyota's willingness to replace those parts. Hatch fix update: since the struts (containing the motor!) were replaced in January, 2015, it hasn't malfunctioned in the same manner as before. However, on two occasions, the hatch did not operate until I put the vehicle in gear and either went forward or back a few feet, put it back in "park" and tried again. And, probably not related to the hatch issue, every so often the treble, mid-range and bass controls reset themselves. Haven't noticed anything consistently causing that to happen. Anyone else experience that? Thanks. Our 2015 highlander has been having the same issues on and off since we got it. We tried to reset it whenever it malfunctioned but most of the time the issue would resolve itself - so we had no idea what was wrong. The problem came up again in the past few days and hasn't resolved itself this time. Today we took it in the shop for scheduled service and told them to check the lift gate, they called back saying the motor has to be replaced. So hopefully that's the problem - it's an annoying problem and always came up the most inconvenient time! USA 2011 Highlander rear hatch hinge. At 38,000 miles my Highlander now has the bent hinge problem. To say we are disappointed that this is, apparently a well known problem, and Toyota is just ignoring it, is contrary to what we thought was the "Toyota way." Keep in mind, this is a garaged kept vehicle driven by two 70 plus seniors and the hinge must have been ruined by trips to the grocery store, where the hatch was opened and closed automatically. We don't really think this would be considered "rough service". In any event, if Toyota won't repair a well known defect, it makes one wonder what they do actually guarantee. Honda Pilot may be on the horizon, although I thought we were Highlander for life owners. I don't know if this would work or not, but with the liftgate in manual mode, open it all the way. Turn the automatic mode back on. Press and hold the liftgate button until it beeps 4 times. This should "set" the liftgate's opening. If you've tried it, and it didn't work, then I would recommend seeing your dealer for replacement struts and motor. Good luck! Thanks cromagnum-man. I never knew about that button in the glove box. Apparently I hit it while changing the cabin filter and my power hatch wouldn't work at all. I only got two beeps and had to operate it manually until I had time to check this forum. I just went out and hit that button and all is well now. Thanks. My 2016 highlander had a similar hatch problem. When activating the remote all I got was two beeps and nothing. Pushed the glove box button to no avail. So what I did was start the car, push the glove box button and attempt to open the hatch remotely from the inside of the car. Didn't work. Shut the car off, and tried it again from the outside and it worked fine. Don't know what fixed the problem, but it took me the better part of an afternoon to deal with this. I'm very disappointed in Toyota. Did I mention I can't flatten my 2nd row seats? It just never stops. My 2015 Highlander has malfunctioned twice and dealer also "resets" it. Always jams when we are out of town. Yesterday a cousin was looking at my HL and thinking of buying one when the lift gate malfunctioned AGAIN!! You may have lost a sale, Toyota! I had the same problem with my 2014 Toyota Highlander Limited. I tried everything in this blog but nothing worked. Fortunately, a new dealership recently opened only 15 minutes away and were open Saturday. I drove the vehicle into the shop and as I was getting out of my vehicle I was explaining to the guy the problem. Before I was even out and walked around to the back, he had opened the glass window on the rear hatch all the way and then closed it fully and everything worked perfectly again. Who knew. Hope this helps anyone else with the same frustrating issue. I had the same issue. The glass window was open. When we made sure it was closed, the door worked again. You may also need to turn it off in the glove box, lift it up and press and hold the button on the door to reset it, and turn it back on in the glove box to make it work again. I am having issues with my 2014 Highlanders mortgage. Tried everything discussed in this forum and have had no luck. Please tell me someone has found a solution to the hatch issue. The tailgate on my 2014 Highlander seems to be working fine, but I suddenly I have an alert on my dash that is flashing, showing that it is open. Tried to close it multiple times, including the glass, but still flashing! Anyone else ever have this problem, and what's the fix? I'm hoping it's something easy like a fuse. Since the door is working fine, and you've made sure the glass is closed, but you're getting the door open light, the likely candidate is the switch that closes when the door latches. 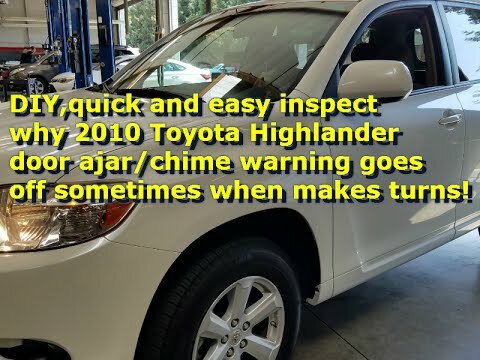 Here's a video I found about a 2010 Highlander door warning light coming on. Interesting to watch the diagnostic process. Came down to the back door lock switch, which sounds a lot like your problem. The liftgate latch assembly (and the switch it contains) is the gremlin. I don't know if this would work or not, but with the liftgate in manual mode, open it all the way. Turn the automatic mode back on. Press and hold the liftgate button until it beeps 4 times. This should "set" the liftgate's opening. ..... Good luck! To Alimin: Thanks for the reminder about the button in the glove box for the liftgate. All I had to do was press the button, I assume to the 'on' position and the gate worked. And I was just getting ready to take it to the dealer. Did I say thanks! Hope you have a great day.